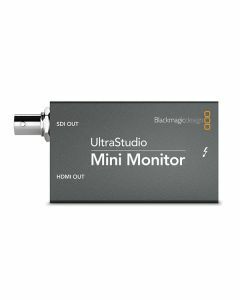 When you need low cost monitoring for editing, then UltraStudio Mini Monitor is perfect. Plug in the Thunderbolt and monitor out of the SDI and HDMI outputs. Perfect for using low cost HDMI TV's and projectors for monitoring. SDI Video Output: 1 x 10-bit SD/HD switchable. SDI Audio Output: 8 Channels embedded in SD and HD. HDMI Audio Output: 8 Channels embedded in SD and HD. Other supported applications include: Nuke, Steinberg Nuendo, Avid Symphony, Avid News Cutter, Tools On Air just:in & live:cut & just:play & just:live, Softron OnTheAir, MovieRecorder and OnTheAir CG, Flash Media Encoder, Wirecast, Livestream Procaster, Resolume Avenue 4, Sony Vegas Pro, Corel VideoStudio Pro X4, CyberLink Power Director, MAGIX Video Pro X4, Vidcaster Pro & Studio & Broadcast, Uniplay, Playbox AirBox, CasparCG, Magicsoft CG, Xsplit Broadcaster, Imagine Communications Velocity & InfoCaster. HD Down Conversion: Software based down conversion during video playback.